Report your turtle sightings by entering your observations into our on-line database. The purpose is to collect, record and store location and species information on Ontario turtles, including species at risk. Turtles are most often seen in June when they are traveling to reach their nesting sites. Adopt-A-Pond can help you learn to identify turtles by using our online resources! Contact Adopt-A-Pond to receive a hard copy of our Ontario Turtle Tally Package or see our on-line Turtles of Ontario guide to learn to identify the turtles in your area. All data collected online is shared with the Natural Heritage Information Centre (NHIC) and the Ontario Reptile and Amphibian Atlas at Ontario Nature. Follow these 4 easy steps to become a Turtle Tallier! 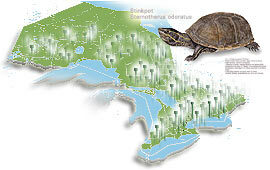 Please note that red-eared sliders are not native to Ontario. Please let us know if you found a slider by leaving a comment in the "Additional Comments" box on the sighting submission form!